Sew the Library Monthly Link-up: Coming in January! It seems that I'm not the only one with a shelf of neglected sewing books. Several of you mentioned that you were also hoping to sew through your own libraries in 2015, and a few of you even asked me to start a monthly link-up to keep us all gently accountable. 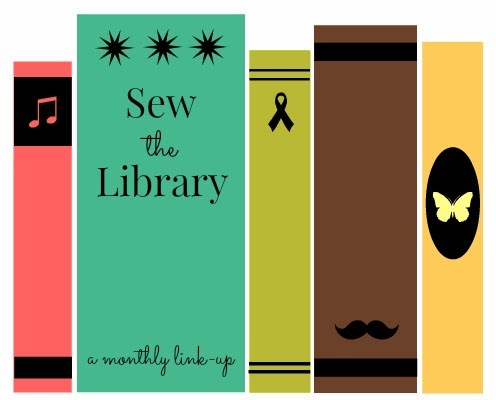 As a result, we're officially launching a Sew the Library Monthly Link-up in January! 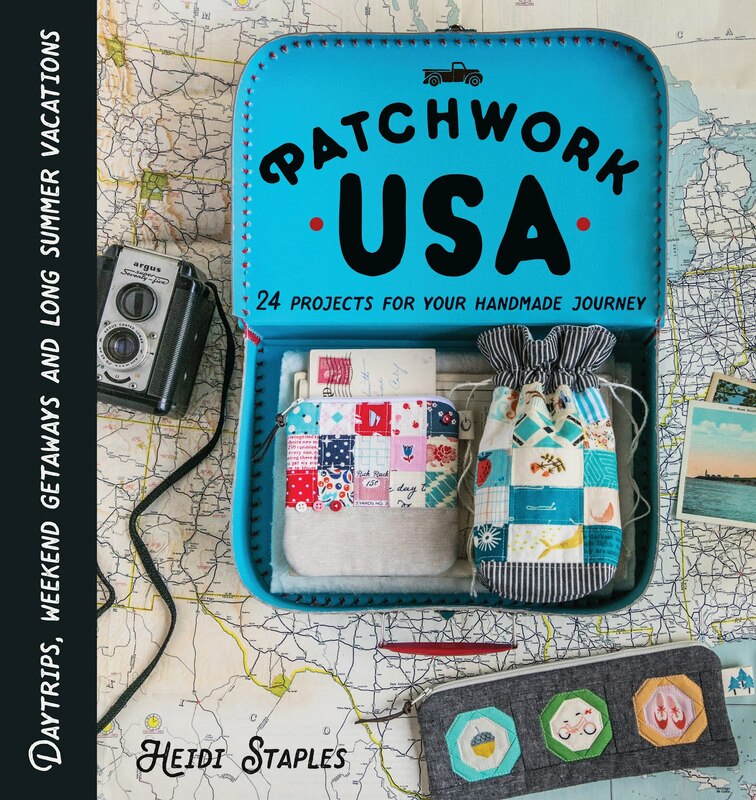 From the 20th until the last day of each month, you can link up any project you've made from a sewing book or magazine during that same month. We'll make an exception in January and let you include anything from December too, since I'm hoping you'll get some Christmas goodies that you can use for this! In your post, be sure to mention the book you used and feel free to include a photo or a link to where it can be purchased so that others can easily find it too. The January link-up will be here at Fabric Mutt. In February, we'll be linking up at Martha's blog Weekend Doings, and in March, you'll be linking up with Jodi at Tickle & Hide. I'm so grateful to these sweet, talented friends of mine for giving me the push I needed to get all this started! We're going to give this a trial run for three months, and if we can get a group sewing along, we'll keep it going through the rest of the year. This is not only a great opportunity to sew through our own libraries, but it's also a great way to get exposure to new books we might have missed along the way. If you have any questions, just send me an email at hjstaples@gmail.com or leave a comment below. I'm pretty excited to get started! One of my goals this year is to Sew the Library. I have so many fabulous books on the shelf in my sewing room that aren't getting the attention they deserve, and that just shouldn't be. My plan is to make a project from one of my sewing books at least once a month, hopefully twice. This month I made a quick laptop sleeve from Laura Jane Taylor's lovely book, Quilt-opedia. Quilt-opedia is a book that I've had my eye on for a long time. I really love Laura's talent for mixing colors and prints to produce a look that's sort of vintage modern. This is a nice book for beginners, since it goes into great detail on quilting techniques and finishing, but I also think it works well as a quick reference for gift projects during the holidays. There are tons of photos and illustrations, as well as a useful quilt block directory in the back of the book. I desperately want to make the Obsession Quilt featured on the cover! My dear friend Becca snagged some new Cotton + Steel for me at Fall Quilt Market, and I've been torn between wanting to sew with it and being afraid to touch it. Last night I finally decided it was now or never, so I pulled out my favorite linen pieces from Playful and Mesa. This fabric...what else is there to say that hasn't been said by everyone else? It's so beautiful, so fun... I kind of want to upholster my entire sewing room in prints by Melody Miller, but for now I'm contenting myself with making a sleeve for my laptop. I followed Laura's great directions which gave me the perfect fit for my machine -- a victory that has sometimes eluded me with previous tech projects! The pouch is lined in one of my favorite text prints, a dictionary design by Tim Holtz. I added a pink and white striped hair fastener (love that touch of whimsy!) and a vintage style leather button to make an easy closure so that I can keep the laptop secure when in transit. All the top stitching is done using gold Aurifil thread. It always amazes me how truly painful it can be to sew with a treasured piece of fabric. The pressure is huge. Holding that finished project, though, and knowing that I'll be able to see this fabric every day on my desk...well, it feels pretty great. Sew with a print from your special stash today, even if you just use a tiny piece of it. You'll be so glad you did. 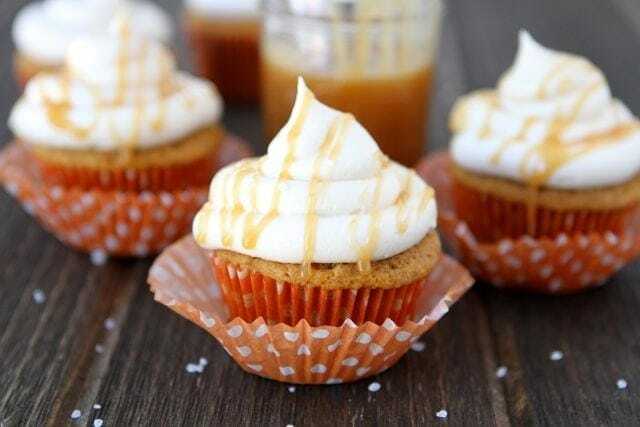 Oh, you guys...I can't believe the day has finally come when I can write this post! I've been working on this project officially since summer 2013, but it's been on my mental radar since the end of 2012. It's an absolute joy to present you with my book: Sew Organized for the Busy Girl, due out in March of next year. It's already available for pre-order on Amazon and C&T Publishing (where you can see some project pictures too! )..and yes, I'll admit that I check those sites once in a while to remind myself that this is all actually happening! I've always tried to be real with you here, and I want to keep it that way. I wouldn't have written this book if I didn't hope that someone would read it, so I'll be sharing some projects and ideas from it in the coming year. However, I am not going to beat you over the head with my book from morning till night. It's really important to me that I keep this a place where I chat with you about what I'm sewing and how it all fits into daily life...and honestly, Sew Organized is just an extension of that. I wrote it for all of you out there who, like me, are struggling to fit sewing time into your busy schedule. If there's anything special you'd like to know about it or would like to see in a book tour, feel free to let me know in the comments below, and I'll do my best to work it in. I really want this to be actually helpful to you! I've been meaning to make some more pot holders, and Rashida Coleman-Hale's adorable new Mochi line has just the right colors for brightening up my kitchen. I kept things as minimal as possible -- no piecing and very simple quilting. Pink and white twill tape made perfect loops for hanging, and I bound them in a grey canvas print from the collection. These finish at about 7" square. Now everybody's happy: my kitchen, my pot holders, and definitely me. It struck me several weeks ago that Dreamin' Vintage by Jeni Baker and Far, Far Away by Heather Ross have unbelievably similar color schemes. In fact, they look absolutely darling together. 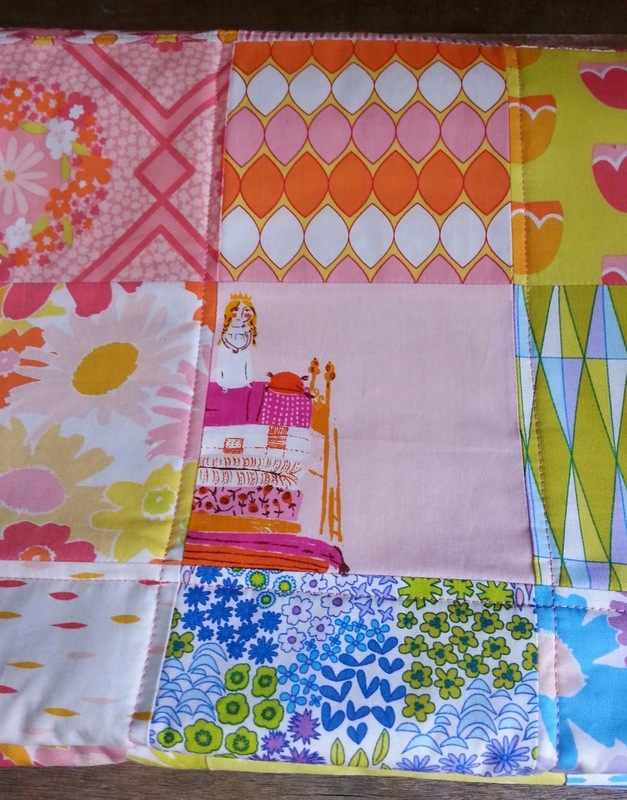 The colored patchwork in the middle of this quilt is surrounded by tiny pink La Creme dots by Riley Blake. It's backed in one of Jeni's florals, and I bound it with a great aqua and cream star print from Unicorns and Rainbows by Doohikey Designs. It all works perfectly together for a little girl's bed, and I was so happy to give this to my niece at last. Since I have two nieces, there will be another one of these in the works as soon as I finish up a few other projects on my list. You'll find me here and there on this glorious first day of November, my favorite month of the year. I have a project in Issue 2 of fabulous new Make Modern magazine: the Tagalong Pouch which you see above. It's a quick project and one of my favorites. Some of you may remember seeing an early version of this on the blog last year when I made one to hold an electronic Leapfrog toy for Bear's birthday. These pouches are perfect for carrying everything from tablets to library books. Mostly, though, I love picking out the squares for the patchwork on the the front. The Handcrafted collection by Alison Glass is really as beautiful as they say it is. As a rule, I admit that I'm not so into anything approaching the category of "batiks," but she makes it work by keeping the designs simple and the colors brilliantly saturated. The fabric weight is perfect for garments and quilts, but Alison (who is, by the way, just as lovely as her fabric) asked me to make a few bags for her market booth. I made a Malibu Satchel and two variations on my Nora Clutch. The prints are paired with pieces of chambray by Andover, and I love the way they work so well together. I bought a layer cake of the collection after sewing up these samples, and I'm hoping to make a quilt before the year is out. Birch Fabrics is still one of my favorite companies to sew for, always featuring clever designs, beautiful color schemes, and the nicest people. Most of my Market sewing for them this time was done with the new Charley Harper line, Nurture. 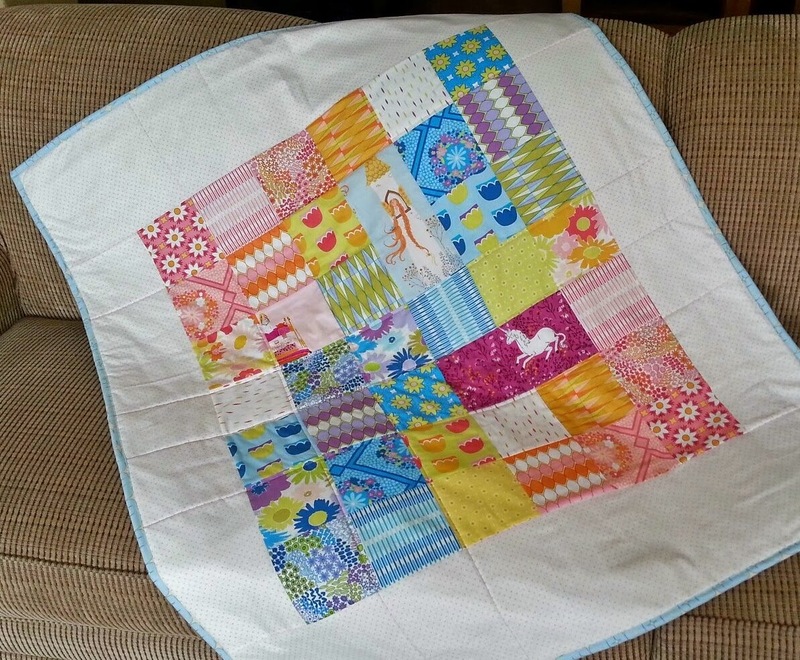 This nine patch baby quilt would be perfect for a little boy's nursery. Here's a close up of those great prints. I love that bottom right block the most. Those colors are just perfect! 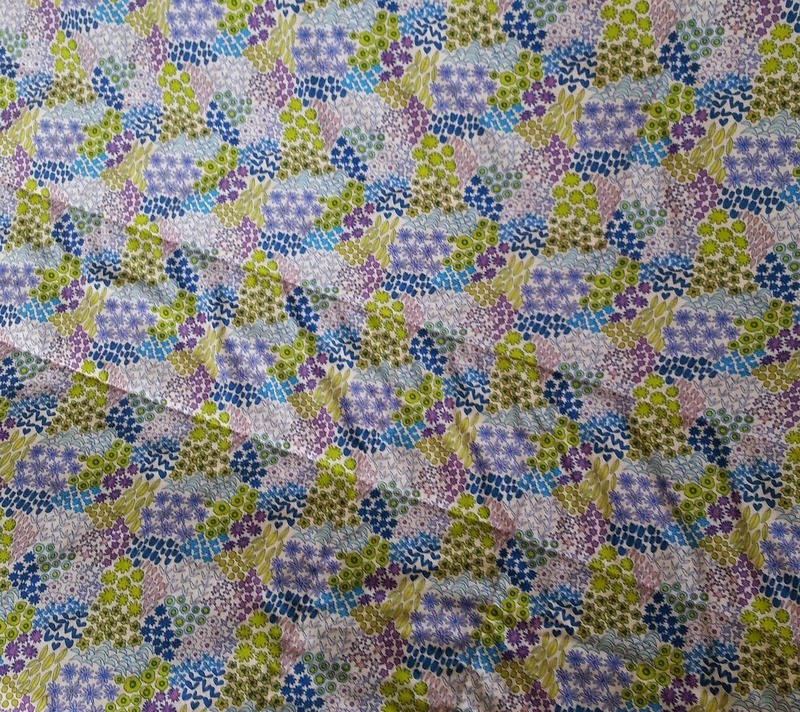 I pieced together leftover fabrics and a cheater print for the backing. There was one extra nine patch block leftover from my original planning stages. I decided that it would make a fun little pillow to go with the quilt. This owl fabric on the back is adorable, isn't it? The Nurture canvas is just right for bags. 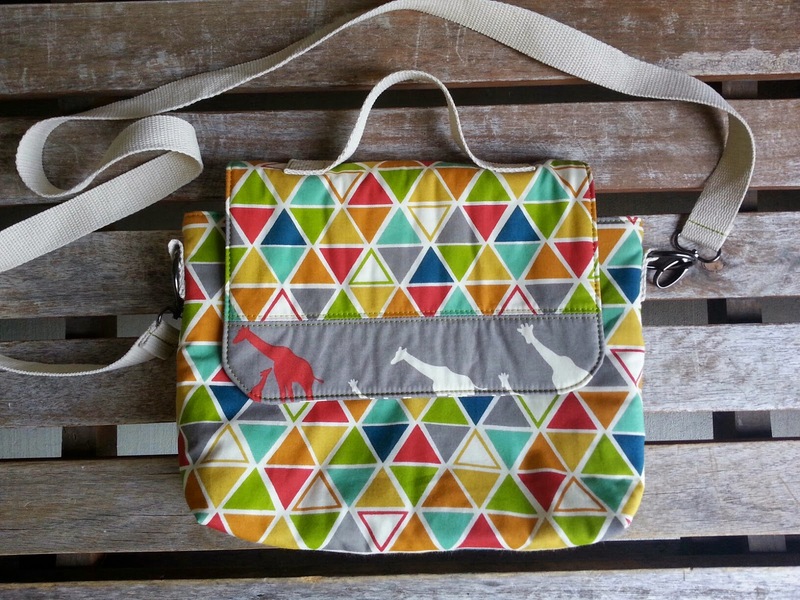 I had a lot of fun fussy cutting this giraffe print for my Malibu Satchel pattern. The feather prints are fantastic basics. I even cut a little piece of canvas selvage for a makeshift label instead of a pocket on this version of the bag. I've been absolutely delighted to see the stunning booth that the Birch crew is putting together. Be sure to stop by their Instagram account @birchfabrics to get a peek! Getting the opportunity to sew projects for Quilt Market is never something I take lightly. There's no question that it's exciting to work with fabric that hasn't yet been released, but it comes with a strong sense of responsibility too. These projects are part of what designers are using to sell their fabric, and it's important to me that my work makes their work look good. 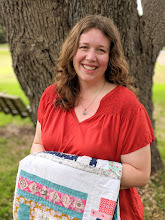 My friend Maureen has a beautiful limited edition collection coming out with Art Gallery Fabrics this fall, and a few weeks back she gave me the challenge of making projects with pieces of her fabric that were approximately 3 x 4" or smaller. She also sent me some coordinating AGF solids to add to the mix. I had a great time seeing how creative I could get with these little scraps. While most market projects are made entirely from large pieces of fabric, I don't think it hurts to show people how a collection looks on a small scale too, especially since scrappy projects are always a popular choice with quilters. Maureen's Wild & Free collection is a beautiful mix of bohemian and traditional styles, and it made me immediately run for my stack of linen to use as a background for all the projects. The version of my Agave Clutch above has the largest scraps I used on any of the projects. The yarn dyed Essex linen in leather works as a simple backdrop for the prints, and I also love the leather ties I used on the zippers -- something I repeated on all the projects I made with this collection. I made a smaller version of my Mosaic Bag to feature the tiniest scraps. The half square triangles on here finish at one inch, and I adore the way they look. It's almost like having a small modern painting on the front of this piece. Maureen's prints line up nicely along the top of the pocket on the back of the bag. I used Andover's denim colored chambray for the background and braided cream colored cord for the handles. The last thing I made was a little coin purse out of black Brussels washer linen. All these bags are lined in AGF solids, and this pouch has an interior of saturated gold that looks fabulous against the navy zipper and dark linen. Using a more limited color scheme, I made four tiny half-inch hexagons and hand stitched them to the front. It's a small accessory, but I really like the way this pouch turned out. Definitely check out Maureen's blog to see the amazing things that she and others have been creating with her fabric. I know her booth is going to be drop dread gorgeous when all of these projects come together in one place! I'll have more Quilt Market sewing to share with you next week, so stay tuned! My parents left on a road trip before dawn this morning, and the next two weeks are going to be tough on my daughters, who are so used to having Grampa and Nana nearby for a hug at any given moment. So I couldn't have been happier when my latest order from Fabricworm showed up in the mailbox yesterday containing the Acorn Trail panel for these darling cut-and-sew animal softies. I've been swimming in Quilt Market sewing lately (pictures of that to come later this month), but I stayed up late last night to make some cuddly friends for my girls. I knew they would be needing them for comfort today. I'm being honest here -- this isn't the best example of my sewing skills. It was well past midnight before I was through, and I was getting a little punchy at the end. God bless kids, though...they don't care if all the edges don't match up perfectly or the opening in the side isn't slip stitched closed. They just give you that happy smile and hug their new toy like it's worth a hundred bucks. "Thank you, Mommy," Bunny said to me quietly as she cuddled her namesake this morning, "for staying up so late to make these for us." And suddenly getting only five hours of sleep doesn't seem like such a big deal after all. 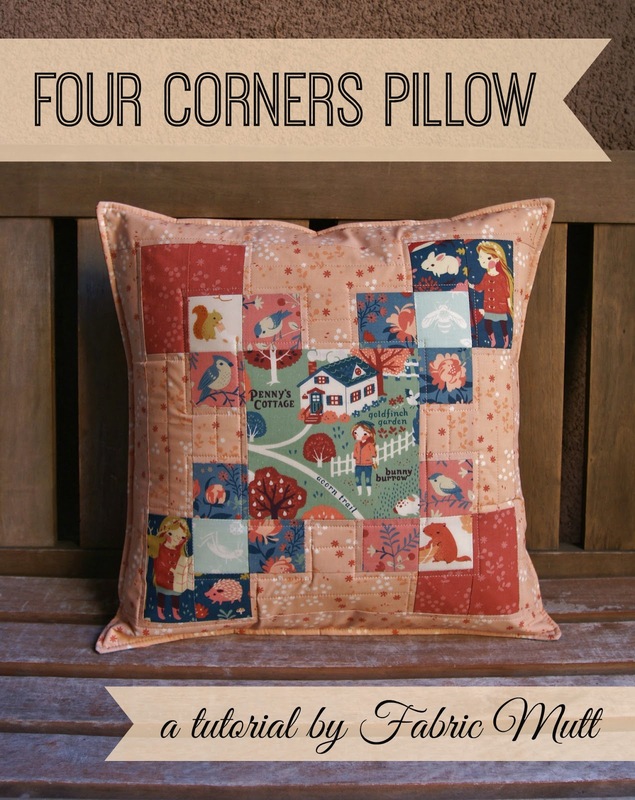 Head over to the Fabricworm blog to check out my new tutorial: the Four Corners Pillow. It features Acorn Trail, Teagan White's latest too-cute-for-words collection for Birch Fabrics. This project is perfect for fussy cutting, but I think it would look pretty great in solids too. Thanks so much to my friends at Fabricworm and Birch Fabrics for letting me play with these gorgeous prints! If you make one of your own, be sure to share photos. You can tag me on Instagram @fabricmutt. I'd love to see it! 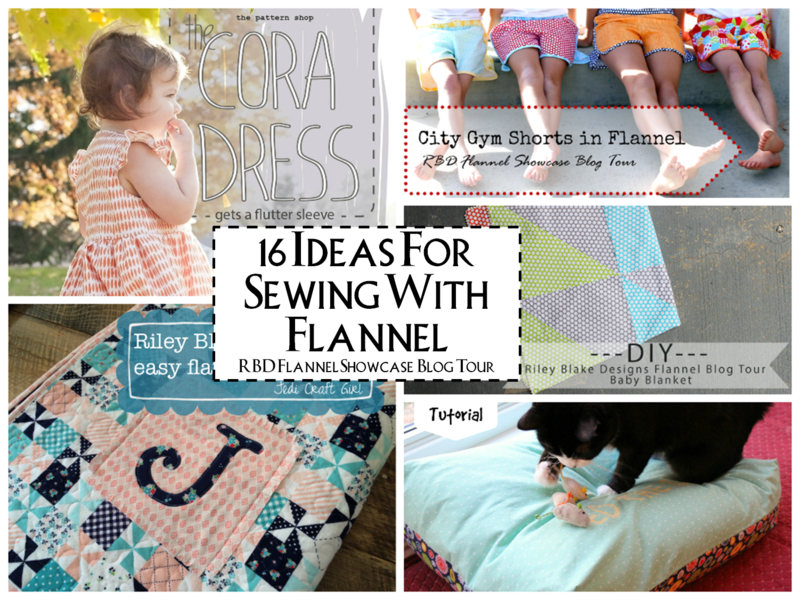 When my friends at Riley Blake Designs asked me to be part of their Flannel Showcase Blog Tour, I was so happy to say yes. In all my sewing experiences of the past few years, I hadn't yet sewn with flannel, so I was excited to have the chance to work with this type of fabric at last. They sent me an incredibly generous package full of the Sidewalks collection by October Afternoon. When I showed the fabric to my family after it arrived, my parents were absolutely charmed by the designs. "That's my childhood," said my Dad, and truly these adorable prints look like they came to my house straight from the 1950s. Everyone at our dinner table has a chair with a built in cushion except my youngest daughter who sits on a vintage wooden school chair. I've been meaning to make a cushion for her seat, and this soft flannel seemed like the perfect material for the job. I wanted to keep my design simple and classic, so I decided to make nine hourglass blocks which I stitched together without any borders or sashing. The blocks are quilted in a pale aqua thread by Aurifil. For the back of the cushion, I chose a blue print since that's my daughter's favorite color. There is no insert for this cushion. I just filled it with stuffing and sewed all the way around the outside edge, a method I love since it adds the illusion of piping and neatly closes the opening in the side of the pillow. I debated adding ties to fasten the cushion to the chair, but in the end I decided not to. It was a good decision. As you can see, the cushion fits nicely in the middle of the chair, making a cuddly spot for Mouse which can be easily moved if needed. 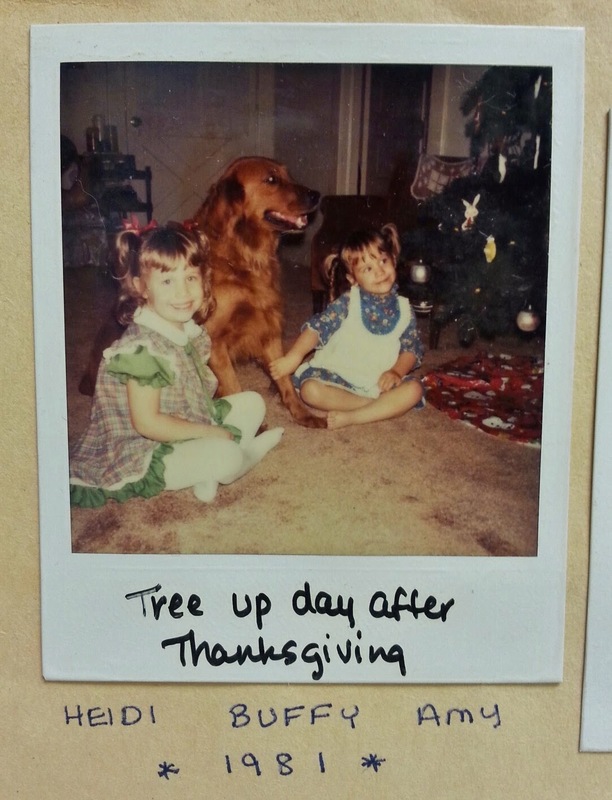 You American Girl fans out there will recognize Kit's dog Grace modeling for the camera here. My Mouse decided from the start, however, that this dog's name was Snuffy, and she carries it with her everywhere...yes, even to the dinner table. Be sure to visit the other stops on the tour for more flannel mania! My Medallion pillow from earlier this month -- see the guest post here at Sew Sweetness. It's been a thoughtful sort of week. First I heard that Sew Fresh Fabrics is closing down. Then I heard that Pink Chalk Fabrics is changing course. Finally I read Holly's post and the article that inspired it. It all has me thinking a lot about this online sewing community. I've only been blogging since the end of 2011, but it feels like things have changed a lot in that short time period. There is SO much out there now. You can find a free tutorial for almost any project imaginable. Fabric companies are releasing more collections by more designers. There are tons of online fabric shops specializing in different bundles and themes. Sewing bloggers are moving beyond blogging to write books, design fabric collections, and start magazines. It's fun and exciting and so inspiring. The best package of my week contained these lovely threads from my friends at Aurifil. The downside is that it's getting much harder to come up with new material because, as my sister always reminds me, there's nothing new under the sun. Copycats are coming on the scene -- some who don't mean to and some who do. There's a constant drive to produce more information at a higher level of quality than ever before. People speculate about whether blogs have replaced magazines, whether Instagram will replace blogs, and what will end up replacing all of the above. I know traditional fabric shop owners who worry about keeping up with online shops, while online shop owners search for a way to stand out in the growing internet market. After all there are plenty of people in this community who are working hard to make their family living from creative blogs and businesses. There's concern about blogger burnout, and for good reason. To publish a single blog post means that you must decide on a topic, develop your ideas, make the project, style the photos, take the photos, edit the photos, write the post, and edit the post. If that post is a tutorial, you can multiply the workload by at least five times. If you're working on a project for a blog hop, a magazine, or a book, it has to stay secret until the big reveal. So while you're doing all this work behind the scenes, you're also scrambling to come up with something else that you can share on the blog so that you don't leave your readers hanging without anything new. Layer that on top of the responsibilities of a family and career, and it all gets overwhelming really fast. A stack of solids for an upcoming project...they remind me of sunset on our mountains. After spending a few days mulling things over, I can't escape the importance of going back to the beginning. Why did we start all of this -- the patterns and the fabric, the blogging and the swapping? We did it because there's something in our souls that loves to create beauty, and it gives us so much joy to do it together. Meeting with you here once or twice a week is like sitting down with a friend in my sewing room, sipping tall glasses of iced tea and sharing our latest projects with each other. It's growing together, learning lessons through the rough times, and sharing the victories that come along the way. When burnout and controversy rise up, we give each other grace and the benefit of the doubt. Friends, after all, hope the best for each other, and in the end, whether we've met in person or not, this all comes down to the simplest of friendships between you and me. So I'm not giving up. If blogs go the way of the typewriter and the cassette tape (both of which are still completely awesome, by the way), I'll still be here on whatever the next wave is that comes through. We'll still get together for our weekly visits, and yes, I'll still be sewing. Because honestly, I love it. There isn't anything else I'd rather do. As some of you may have already seen on Sew Mama Sew, I had the wonderful opportunity to be a part of this month's Cloud9 Wildwood Challenge. Elizabeth Olwen is not only a gifted artist and a lovely person, she also designs utterly charming fabric for Cloud9. Her recent Wildwood collection is a beautifully unique take on autumn, and the small scale prints were exactly what I needed to make a simple hexagon pillow. I used almost every print in the collection to create a herringbone pattern on this 12" square pillow cover. The 1" hexagons took almost a month to assemble and sew together. You can read all about the process in my post at Sew Mama Sew. It was a slow but peaceful project to work on, and I can honestly say that I miss it now that I'm all done. The pillow backing features one of my favorite prints -- Midnight Flora. I love that dark shade of blue and all the little details that Elizabeth added to this design. They almost give the fabric a texture of its own without any stitches added. This little pillow is getting plenty of love these days. I smile every time I look at it. Be sure to visit the other Wildwood Challenge participants to get a look at their projects. So much creativity going on here! Many thanks to Cloud9 Fabrics and Sew Mama Sew for this wonderful experience. I enjoyed every minute of it!